Few would disagree with the idea that a solid education is an important foundation for any career. Since criminal justice careers are so vast and diverse, many people wonder just how much schooling they will need, both to get their foot in the door and to work their way up the company ladder. Many jobs in criminology may only require a high school diploma or GED. These jobs may include dispatchers, correctional officers, and even police officers. However, additional academy training will be required to become a correctional or law enforcement officer. It should also be noted that simply because a degree is not required does not mean you shouldn't think about pursuing one. Other jobs within the criminology arena will require much more extensive schooling. Forensic science technicians, probation and community control officers, and correctional treatment specialists typically require a bachelor's degree. Academic professions, including college professors, forensic psychologists, and criminologists, will need a master's degree or doctorate. For law enforcement and criminology careers that don't require degrees, it may still be wise to consider pursuing some higher education either before obtaining employment or once you are established in your chosen career. Even if you don't obtain a degree, there are a number of benefits to having just some college experience that will help you achieve success. True, there is no substitute for real-world experience, provided one learns from both their mistakes and successes, but spending time in an academic atmosphere can help lay the groundwork for future success. College provides a sterile learning environment in which to hone and perfect invaluable skills required in all criminal justice fields. Report writing, for example, is a major component of any criminal justice job. College courses in English composition can vastly improve writing skills and understanding of the written language, which can lead to more effective communication and efficient reports. College courses in subjects such as debate allow for an opportunity to learn to articulate your thoughts and to defend your points of view. This is an essential skill in dealing with people both within your potential chain of command and in the general public. Officers are constantly scrutinized for their actions and inaction. In order to lead a successful, service-oriented career, you must both be able to accept criticism and explain the reasons for your beliefs and actions. Perhaps one of the most beneficial college-level classes you can take is interpersonal communications. The ability to deal with all sorts of personality types can not only mean the difference between success and failure, but also the difference between making it home at all at the end of your shift. Speaking to people in a manner that makes them feel heard and validated, even if they are proven to be wrong, is often the most effective way to diffuse the volatile situations you are likely to encounter when working with inmates or trying to make arrests. Test taking is also a valuable skill that you can perfect in college and that will enable you to move further up the food chain in a criminology career. In most law enforcement and correctional agencies, promotions are made by creating a list of qualified individuals, ranked based on their performance on some sort of assessment tool that most often includes a written test. By performing well on the promotional exam, you can increase the likelihood that you will be promoted. 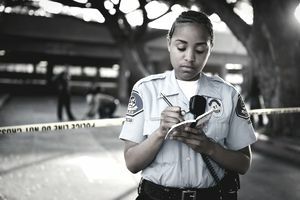 No matter what the entry-level requirements may be for a criminal justice job, it is never a bad idea to everything you can to put yourself in the best position possible to excel. Taking college courses, even if you don't earn a degree, can help arm you with essential tools for success that will place your head and shoulders above the competition, both before you land your career as well as once you're on the job.